O Norman, Norman, wherefore art thou Norman? Whenever I’m out fishing I try to find a little humor in life, whether it’s on the water or on its shores. A couple of weeks ago, I fished the North Mills River with moderate success. When I left the stream to have a picnic lunch with my wife, I put my rod down on a wooden table and lo and behold, look what was staring back at me! I thought the carving effort showed a fine hand. Perhaps Jessica will become an artist some day. Will she become an English teacher or writer? I tend to doubt it. I forwarded this photo to our state’s department of education…. no reply. Whenever I’m out fishing I try to find a little humor in life. 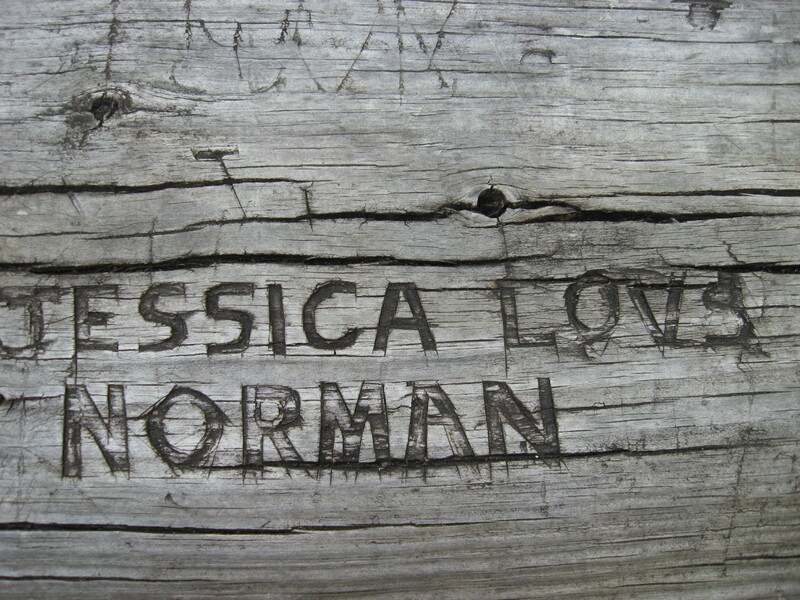 Thank you Jessica and thank you Norman wherever thou art.